ASUS ROG STRIX B450-F GAMING AM4 AMD B450 SATA 6Gb/s USB 3.1 HDMI ATX AMD Motherboard. Experience next-level performance with the ROG Strix B450-F Gaming, powered by 2nd generation AMD® Ryzen™ AM4 processors. Unlock your system’s potential with 5-Way Optimization featuring Fan Xpert 4 while personalizing your build with Aura Sync RGB. 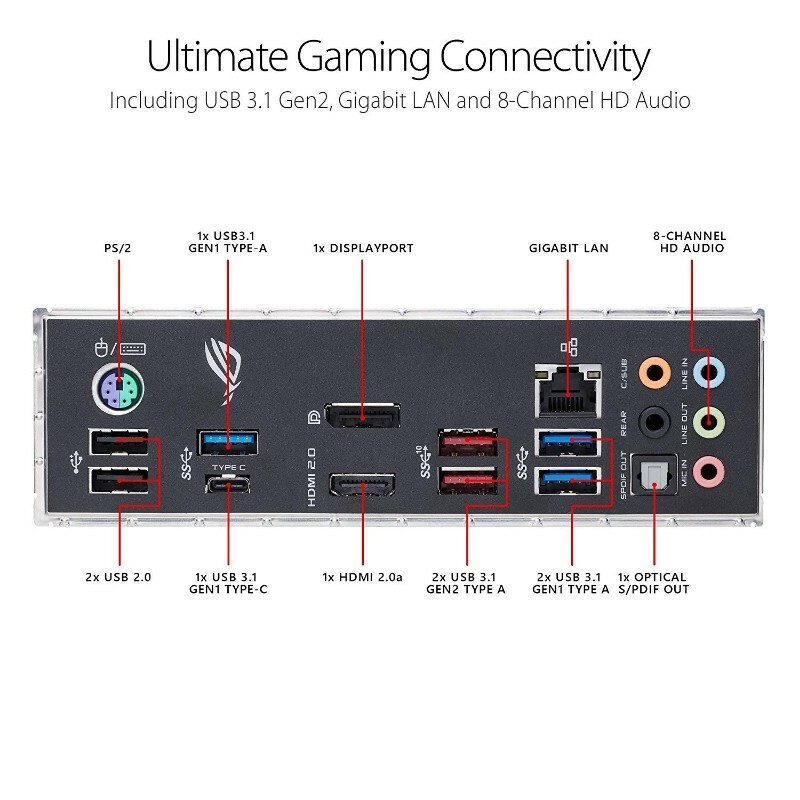 Integrated NVMe M.2, gigabit LAN and USB 3.1 Gen2 deliver maximum connectivity speeds. PERFORMANCE LEVEL UP - With the exclusive AI Suite 3, you can push performance as far as possible for brilliant gaming thrills. Its dashboard-style control panel lets you fine-tune almost every aspect of your ROG Strix B450-F Gaming system. Get the best balance between performance, cooling, stability and efficiency via one simple and intuitive interface. COOLER BY DESIGN - ROG Strix B450-F Gaming features comprehensive cooling options, configurable via Fan Xpert 4 or the UEFI BIOS. Every on board header supports auto-detection of PWM or DC fans. Lastly, a dedicated PWM/DC header for self-contained water-cooling setups. SUPREMEFX - Utilizing the S1220A codec, SupremeFX is the integrated-audio solution that's engineered to provide a flat frequency response for a neutral, detailed sound signature. And to ensure that pristine signature is perfectly preserved, the front-panel output is driven with dual op amps, delivering sonics with the scale and authority to create virtual worlds via your gaming headset. 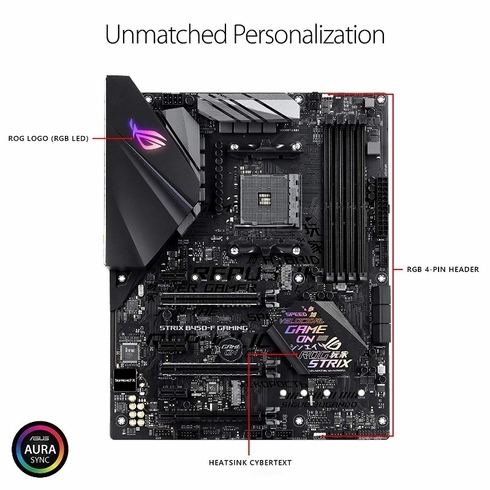 DESIGN, CUSTOMIZATION, AND SETUP - A host of design touches, customization options, comprehensive validation lists, and a diverse ecosystem of components in the industry make building and personalizing a gaming rig with ROG Strix B450-F Gaming wonderfully easy. ROG's patent-pending I/O shield is finished in sleek matte black and comes pre-mounted to make it easy to install the motherboard. OUTSHINE THE COMPETITION - ROG Strix motherboards deliver superior performance and aesthetics to Outshine the Competition. 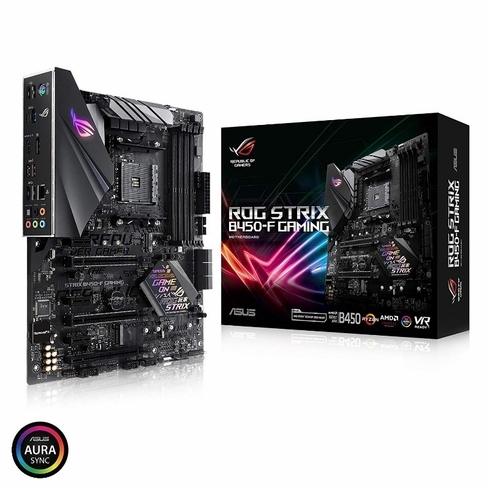 ASUS Aura offers full RGB lighting control with a variety of functional presets for the built-in RGB LEDs and lighting strips connected to the RGB header. All lighting can be synced with an ever-growing portfolio of Aura-capable ASUS hardware. CYBER OUTLOOK - The distinctive sleek cuts across the ROG Strix heatsink are now accented with a futuristic cyber-text pattern, fusing multiple gaming cultures to create a unique identity for this generation. If you prefer a subtler style, you can swap the PCH sticker with an included alternative. The choice is yours. 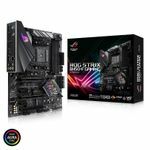 The Asus STRIX B450-F GAMING motherboard supports AM4 processors and will fit in a standard ATX case. This board is powered by the AMD B450 chipset and has support for 4 x 288-pin DIMM memory sticks with a max memory of up to 64GB. You can choose memory speeds of up to DDR4-2133 / 2400 / 2666 / 2800 / 3000 / 3200. 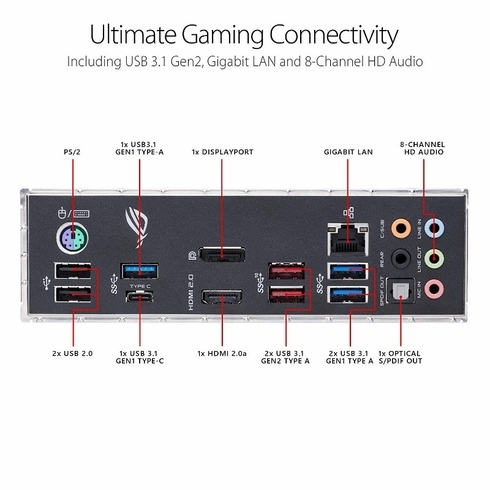 This motherboard has 6 SATA ports. 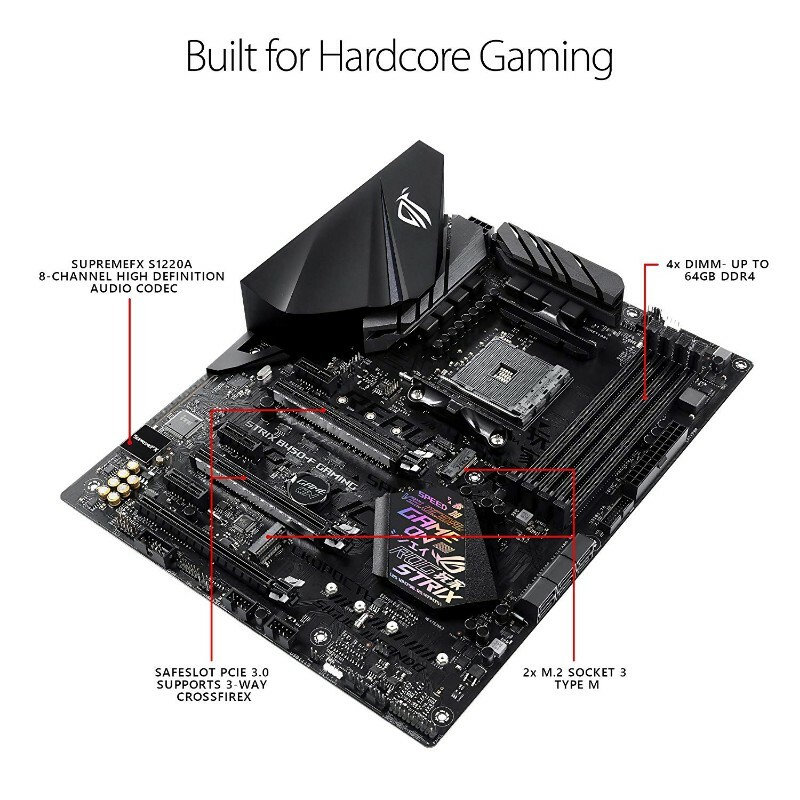 Advanced features of the motherboard include: support for RAID, support for Crossfire, stylish Black design. * Refer to www.asus.com for the AMD CPU support list. * Refer to www.asus.com for the Memory QVL (Qualified Vendors List). * PCIe x16_3 slot shares bandwidth with PCIe x1_2 and PCIe x1_3. * Support StoreMI and NVMe RAID. ** When the M.2_1 Socket 3 is operating in SATA or PCIE mode, SATA6G_5/6 ports will be disabled. *** When the M.2_2 is occupied by M.2 device, PCIe x16_1 will run at x8 mode. * Due to limitations in HDA bandwidth, 32-Bit / 192 kHz is not supported for 8-Channel audio. Upgrading from an AM3+ platform, the Asus pro gaming Aura had served me well. Very glad I decided to stick with Asus they make a top notch product! No problems to report so far, memory set at 3000mhz no problem. It's a solid board, i've been running it for a month non-stop and haven't had a stutter. Highly recommended purchase. Great motherboard. Just a disclaimer, the radiator on the chipset is non rgb. It may seem like it is but it's a chrome lettering. Rog & ryzen 7 2700. Nonthing but the best here. Feature rich mb with better quality componets built in. Like, status leds for boot issues. It has 2 nvme slots. Work & gaming is faster & smoother. Pros: wicked fast when combined with a ryzen7 2700x. Has all the features i desired at a good price.Cons: when using m.2 ssd, the board disables sata ports 5 and 6. This is expected and documented behavior. It becomes a problem when sata ports 3/4 suddenly stop working, leaving you with only 2 sata ports. Upon initial build, i did not notice any problems. 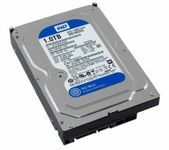 My configuration consisted of a m.2 ssd as the system drive, a sata 4tb hhd in sata 1 for storage, bluray burner in sata2, and a sata ssd for user data in sata3. After installing drivers and software and cycling through a few reboots, i noticed my user data drive was missing. 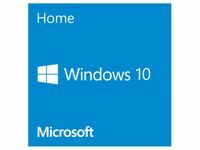 I was unable to find it listed in hardware manager. Booting into the bios, i could see it listed. I changed out cables and tried again, and it no longer showed in bios or windows. Swapping cables between sata1/2 devices and the missing devises resulted in the missing devices showing up and the other devices not showing up any longer. I tried multiple different cable and port configurations. All signs pointed to bad sata ports on the motherboard. I removed the m.2 drive and tested again, as this would remove any disabled ports. 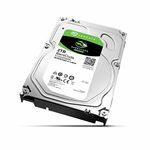 Sata 1/2 and 5/6 would register devices, however nothing from 3/4 in bios. I as well noticed that the front panel lights no longer worked. Checking voltages from the pins showed none present when there should be. It seems like there is a fault on this board.Thoughts : i could swap the m.2 to the other slot and gain access to sata 5/6 ,giving me the number of sata ports i need, however this takes the gpu bus and turns it from 16x to 8x. This was not an acceptable concession to get a running system. In the end, having components seemingly stop working after a few days of ownership does not instill any confidence in the quality of this particular board. I have rmaed and am waiting for a replacement. Was easy to get installed and the user manual is very informative. I am enjoying my new setup. I had this motherboard for a bit, and wasn't entirely pleased with it. Let me tell you why.I was using it with a ryzen 5 2600. I had a mild overclock going and found it would not update to the latest bios, and it kept freezing whenever it tried to. I then reset all the bios settings to stock clocks and then it seemed to be okay with the bios update, but then the bios actually didn't reflect the new changes that asus apparently implemented, including setting the core voltage of the motherboard to a value, instead of an offset. So after troubleshooting it for an hour or more, i gave up.Other than that, it seemed to work fine, but to be honest, it's not a good bang for your buck.If you read a lot of the reviews for this board, the vrms aren't that great, it doesn't come with wifi or bluetooth, and the lighting effects are minimal, with just the rog logo to the top left. 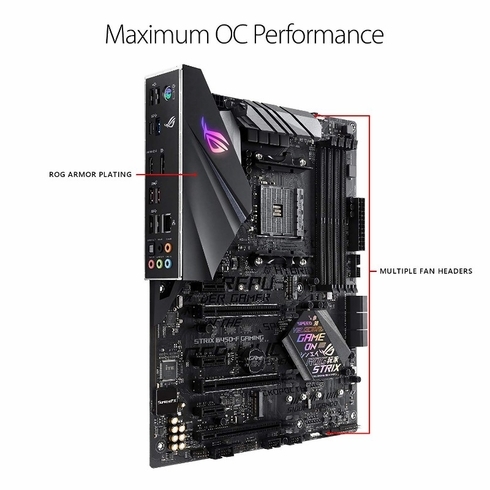 Combine that with a bios that - at least to me - was glitchy, and wasn't updated to being able to set voltage as opposed to an offset for overclocking.. And it just seems like it's way overpriced for what it is.The only thing i can think of that would make you want to buy this board is for asus aura sync, which in some cases does do a better job that other companies' lighting programs. Depends on what you have going lighting-wise.I ended up going for the msi b450 gaming pro carbon ac, which, apart from having a solid bios for overclocking (manual setting of voltage, fan speeds and remembering them), as well comes with wifi/bluetooth, and good vrms (again look up reviews) that perform as well or better than the x470 boards above it. They are both at the same price point, and clearly the msi is more worth the money.